The following information was kindly contributed by our forum members Thorias and Lydux. 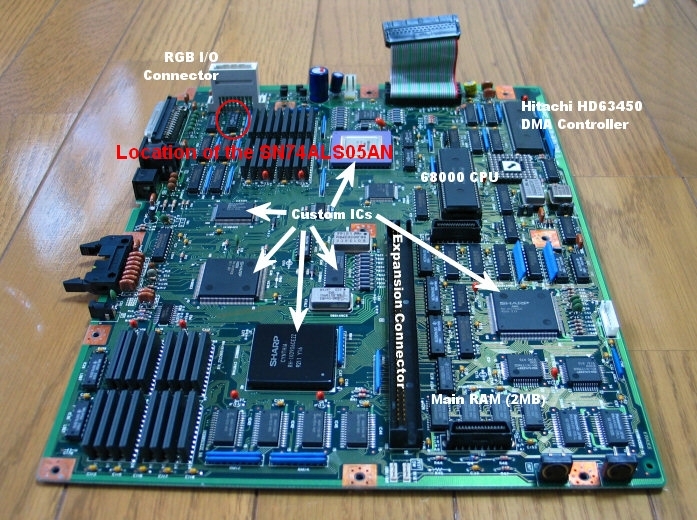 Sometimes when X68000 is connected to LCD monitor the RGB output stops working, SN74ALS05AN sync inverter goes bad and needs to be replaced. Both Hsync and Vsync signals go directly to the SN74ALS05AN from RGB output pin 14 and 15 and it is located next to the white onboard RGB connector. There is only one type of this component on the entire motherboard so you can't miss it. On Compact XVI models the sync inverter is IC118 (74ALS04) and is located on the back of the motherboard.